Collies' coats require regular care. 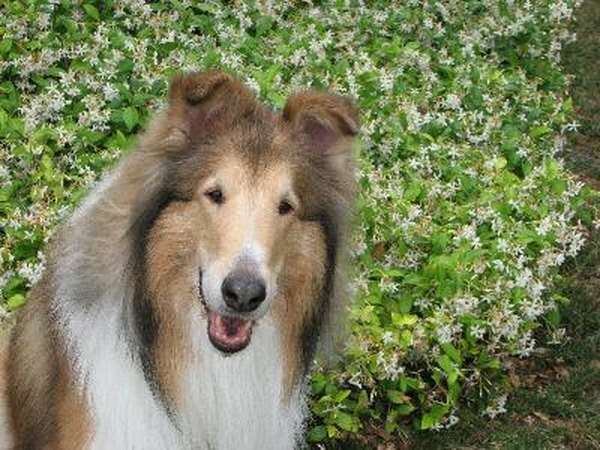 Collies are known for their long, luscious locks. But collie fur can quickly turn into a matted mess without proper care. 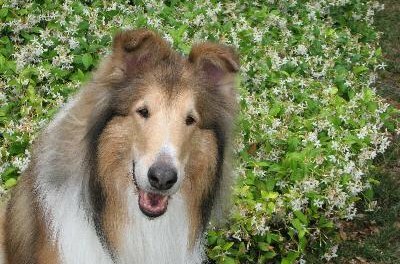 In addition to regular grooming, there are several steps you can take to ensure your collie's coat stays gorgeous. Choose a healthy, filler-free diet for your collie. Fillers such as corn and wheat can cause skin problems that lead to a dull, lifeless coat. Opt for foods that contain no filler. All dogs need high quantities of protein to remain healthy, and the first few listed ingredients in your dog's food should be meat, not meat by-products or preservatives. Give your dog one fish oil capsule each day. Fish oil contains healthy fatty acids that can improve skin health. Healthy skin equals a healthy coat, and fish oil is especially helpful if your dog struggles with dry, itchy skin. A probiotic such as plain white yogurt can also prevent skin and coat problems. Give your dog one tablespoon of yogurt per day. Brush your dog daily with a boar-bristle brush. Boar-bristle brushes don't remove tangles, but they do help to distribute the oil in your dog's coat evenly. This can help the coat look shinier and healthier. Bathe your dog regularly, but avoid excessive bathing. Instead, give your dog a bath once every month or two, or when she looks dirty or smells. Excessive bathing can dry out your dog's fur, and collies are susceptible to dry, matted fur, especially along the hindquarters. If your dog struggles with dry, itchy skin, an oatmeal shampoo can give her relief. Use a shedding blade on your dog's fur during the winter months. Collies are double-coated dogs with a thick undercoat that tends to come out in clumps. A shedding blade will reduce excessive shedding and prevent mats. Start at your dog's neck and work backward toward her tail. Then brush her chest and belly, finishing with her legs. Spray your dog with a grooming spray, which can help to moisturize dry hair. Then brush her with a wire slicker brush. If your dog is matted, use a dematting comb to remove mats. If your dog is very matted, a competent groomer can remove the tangles to give you a fresh start for a healthier coat. Collies; H. Sundstrom et al. Do Cooked Eggs Make Your Dog's Coat Shiny? How Often Should You Bathe a Maltese Without Ruining Its Coat? Are Eggshells Good for a Dog's Coat?